The biggest tournament of football UEFA Euro 2016 will start at 10 June 2016. This This 15th edition of Euro Cup is hosted by France. Previous time here played 16 teams but Euro made here a new rule and in this edition here total played 24 teams. Already 20 teams has confirmed this tournament. The twenty teams jersey and kits was already leaked and here we make a content about the jersey and kits of Euro Cup 2016. # Austria: Austria has already qualified for the main tournament of Euro Cup 2016 and this time their jersey will made by Puma. Their long term jersey and kits deal was extended 2014. 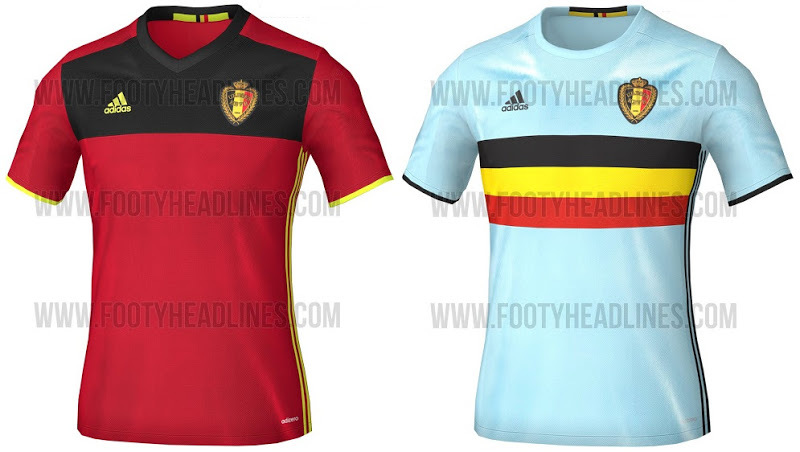 # Belgium: For this Euro Cup Belgium jersey will made by Adidas and their home and away twice jersey will made by Adidas. Adidas design a unique jersey for Belgium and here they make a combination of three traditional colors of Belgium (Red, Yellow & Black). Vapour Blue is the full color of this jersey. Adidas also made their training jersey. # Bosnia and Herzegovina: Bespoke designs is the sponsor of Bosnia and Herzegovina jersey. Bespoke designs made their jersey with a combination of yellow and bright blue. Bespoke designs also design their away kits and this will blue, white combination. # Czech Republic: Czech Republic was extended their kit and jersey deal with Puma for nest ten years. So their Euro jersey will make Puma. # Denmark: For Euro Cup 2016 Denmark jersey will made by two combination of red and their away jersey will white and black. Their Euro jersey also made by Adidas. # England: Nike will make England home and away jersey for Euro 2016. This time Nike combines white and dark blue combines and also their away jersey will red and white blue details. # France: For Euro 2016 Nike will make T-shirt for France national teams and they also design it to uses the light blue colors. The away kit will white with navy and red colors. 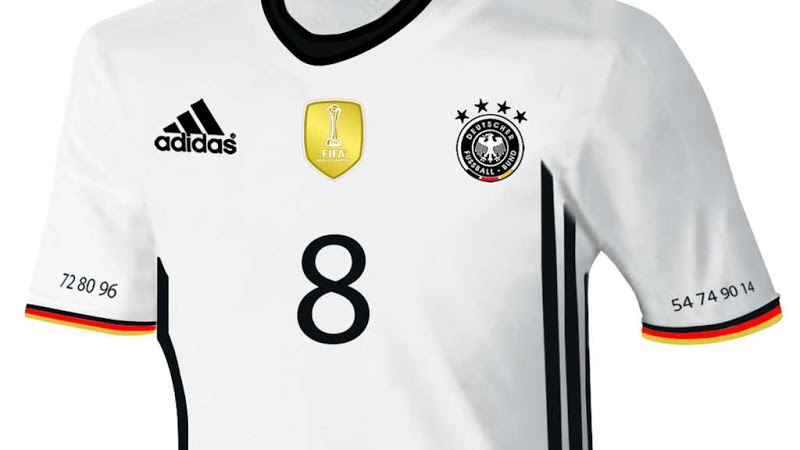 # Germany: This year Germans jersey will made by Adidas and this time they made a classic design. Germany national national teams jersey will also classy white and black colors. Their away T-shirt also designed by Adidas. # Iceland: Iceland will play its first Euro Cup in France and Errea has making their jersey since 2004. But for Euro a big brand company has to chance to made their jersey. # Ireland: Ireland is also a new team of Euro Cup 2016 and for this tournament Umbro will produce their jersey. 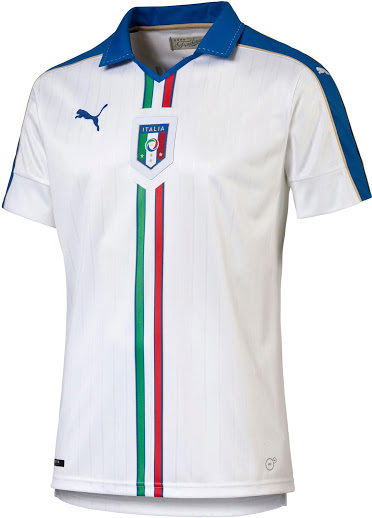 # Italy: For this Euro cup Italy’s jersey will made by classy design with vertical stripe. It’s inspired by Italian flag to made it. Puma will sponsor their jersey this time. # Netherlands: If Netherlands will qualify for Euro 2016, Nike will produce their jersey. They new 2016 Netherlands jersey is combination of orange and blue. The away jerseys color, shirt is navy and light blue. # Northern Ireland: Adidas will make the Northern Ireland jersey for Euro Cup 2016. # Poland: Poland jersey color is red and white, both color is their traditional color. # Portugal: For Euro Cup 2016 Portugal home jersey will be red and white, and their away jersey will teal and navy. # Romania: Spanish shirt supplier Joma will made Romania home and away jersey. Romania home ans away jersey will also feature with traditional color of their country. 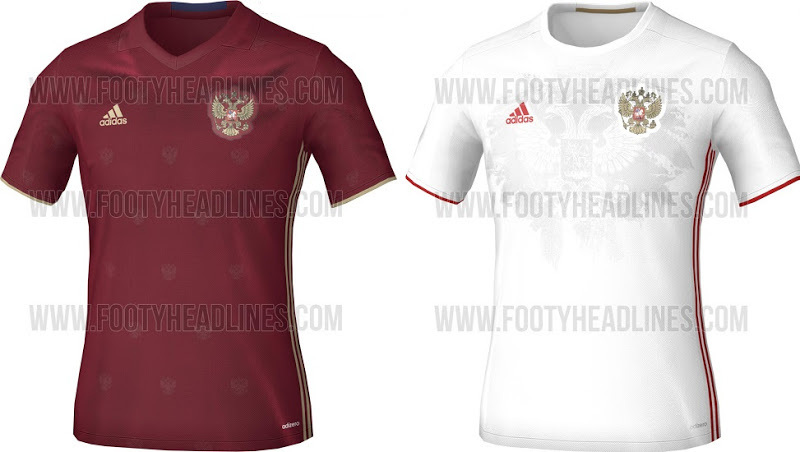 # Russia: The new Adidas will make Russia jersey and their jersey color will combination of maroon and gold. And the away jersey has a striking graphic pattern on front side, it design for the young generation for Russia. # Slovakia: This time Puma will produce Slovakia jersey. # Spain: Spain home jersey will traditional combination of La Roja where the full jersey color is red and the short is blue. They also wear blue socks. Spain away jersey is white with red and yellow graphics pattern. # Sweden: Sweden home kit is white with “Bright Royal” with a classic design. Their away kits is dark navy and grey combination with a modern design which inspired by Sweden youth style. # Turkey: The jersey of Turkey for Euro Cup 2016 will supplied by Nike and their kit color will black and white. # Ukraine: The Ukraine jersey color is yellow and blue with golden details and here all color is the traditional color of Ukraine. # Wales: Adidas will make the new jersey of Wales after the German brand. Adidas will design a new color of jersey for Wales. This is the jersey and kits list of all teams of Euro Cup 2016 and maximum well known brand will make the jersey of all teams. Recently this all has released and also teams jersey is due to leak. Guys stay with us for more Euro news.